Diamond Mining: You're Killin' Me, "Smalls"
Meanwhile, banks have become skeptical on the midstream part of the industry by restricting their lending within the diamond mining industry. Anglo American reports a 25% year-over-year decline in sales in dollar terms for its first diamond cycle of the year for De Beers. Sales were down 7% compared to the previous cycle. Bank of America Merrill Lynch analysts noted some similarities between Anglo American's report and that of Petra, even though the former referenced a high base comparison against the last sales reported. Petra reported a disappointing price based partially on mix, BofAML added. The firm also noted that Alrosa downgraded its sales guidance for fiscal 2018 by 5% as demand for its smaller-size rough diamonds weakened in the last half of the year. 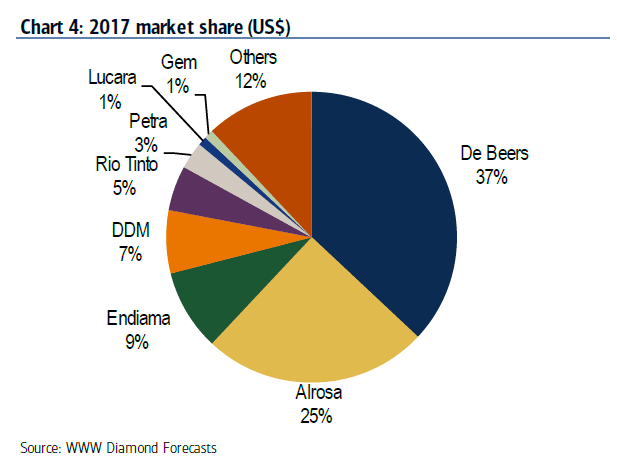 BofAML analyst Kevin Kerdoudl and team said rough diamond buyers appear to have become more selective with their purchases. They also found that buyers have generally been rejecting lower quality and smaller stones. They report that Alrosa and PDL are the most exposed to this trend, while Gem and Lucara should benefit from the preference for larger stones. 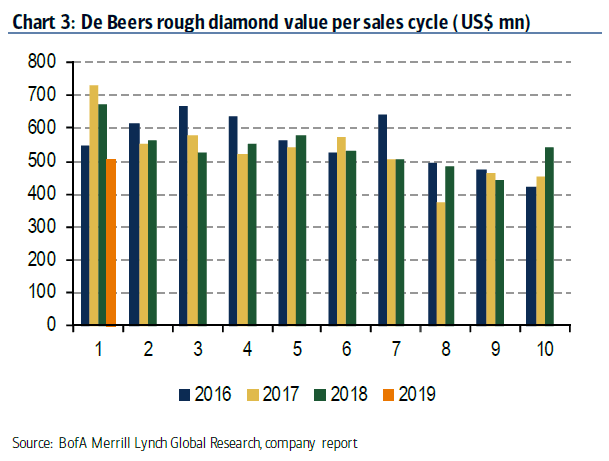 Although overall diamond sales disappointed, the BofAML team said essentially all of the disappointment is coming at the smaller end of the spectrum in terms of stone size. They said diamond miners who mainly produce larger stones are actually reporting year-over-year price increases. They note that price per carat is based on the quality and size of the stone, so historically, prices have been somewhat uniform across the industry on a per-carat basis. However, they said that some newer diamond mines like Gaucho Kue have been producing such large quantities of smaller stones that the supply/ demand equilibrium at the smaller end of the supply chain has been upset. The result is an oversupply of smaller stones relative to larger stones. They also believe that RIO's Argyle mine, which has been a major producer of smaller stones, has been destocking and overproducing. The BofAML team noted that DeBeers holds a 37% share of the market, and its production guidance for 2019 was 31-33 million carats, down from the historically high 35 million carats last year. They also expect Argyle to slash its output this year before closing next year, so the one to watch, in their view, will be Alrosa, since its plans are unclear for now. Kerdoudl and team also report that banks are now starting to look on the diamond industry as too risky because profits are pressured. They note that the low and mid-value diamond midstream mostly takes place in India. 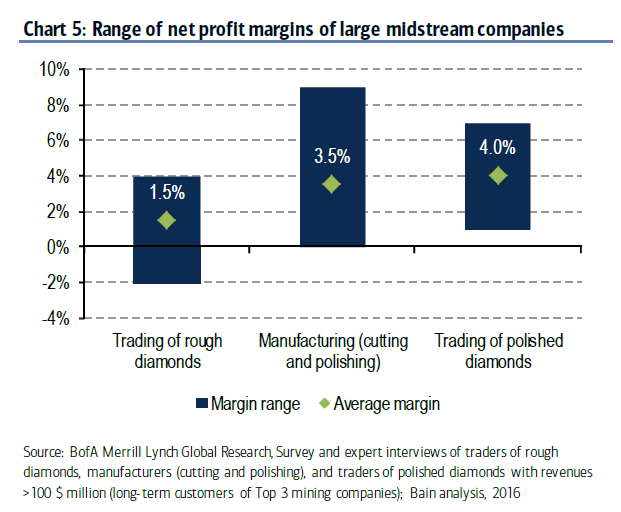 However, midstream margins have become pressured over the last few years due to relative higher prices for rough stones and increased bargaining power on the part of retailers. They add that banks have begun constraining lending to the industry, "no longer willing to take 'equity style' risks for debt return. Banks are also starting to demand substantial collateral. The result has been increased borrowing costs and higher collateral requirements for cutters and polishers. Additionally, the BofAML team said banks are exiting the industry by removing their available credit or financing lines. Although pushing unprofitable or highly-leveraged midstream suppliers out should be good in the long term, they warn that rough diamond prices could see increased volatility in the short term.